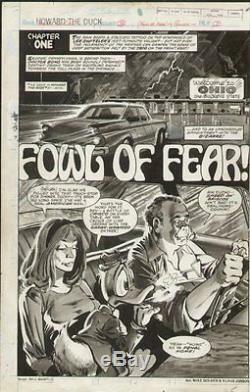 HOWARD THE DUCK MAGAZINE # 1 - MICHAEL GOLDEN ORIGINAL ART - TITLE SPLASH 1979. Check out this simply stunning original art page by Michael Golden - the very first story page from the very first issue of Howard's B&W magazine from 1979. Thanks for looking - check out my other auctions for more original comic art and comics-related items. You'll be glad you did! The item "HOWARD THE DUCK MAGAZINE # 1 MICHAEL GOLDEN ORIGINAL ART TITLE SPLASH 1979" is in sale since Tuesday, August 09, 2016. This item is in the category "Collectibles\Comics\Original Comic Art\Splash Pages". The seller is "usadream10g2x" and is located in Bath. This item can be shipped worldwide.